Home/Greensburg, Heritage House/Heritage House of Greensburg Congratulates Andrea Trowbridge! Heritage House of Greensburg Congratulates Andrea Trowbridge! We are so proud of Andrea Trowbridge for receiving her Social Services Designee Certificate! 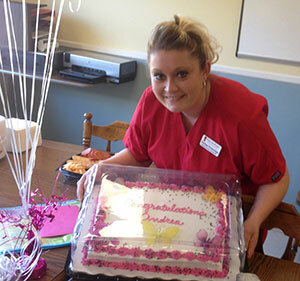 On Friday, Heritage House of Greensburg staff threw Andrea a surprise party to celebrate. Andrea has worked for Heritage House since 2003. Great job Andrea! Heritage House of Richmond Wins 5-Star Medicare Award! Happy Fall! HHG visits High Point Orchard! Happy National Nursing Home Week! At Heritage House, we are always looking for new ways to create a comfortable and homelike environment for our residents because their well-being and happiness is our number one priority.